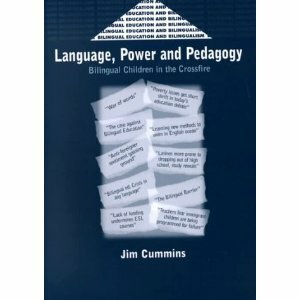 Canadian curriculum and literacy theorist Jim Cummins discusses the problematic application of bilingual education, drawn from his experience in schools in California and francophone Canada. I spoke in one of the breaks with a group of educators from one of the districts that operated a Spanish-English dual language program which appeared to be functioning very successfully for both groups of students. These educators wondered how the focus on language connections could be put into practice in the context of their dual language program. Formal English literacy instruction was not introduced until Grade 3 and there was some pressure to postpone it for another year, until Grade 4, in order to provide even more ‘psychological space’ for the minority language to develop to a higher level. The two languages of instruction in bilingual programs should be kept rigidly separate. Instruction in the two languages (e.g. 50/50 models) and/or introduce literacy in both languages in Grade 1. • Transfer of literacy and concepts across languages will happen ‘automatically’ and thus as much instructional time as possible should be provided for the minority language to develop because the majority language will Took after itself and students will catch up rapidly after formal English instruction is introduced. This is in accord with Hornberger’s (1989) discussion of cross-lingual transfer in the development of biliteracy. She notes that ‘highly efficient reading/writing ability in LI does not make up altogether for lack of knowledge of L2′ (1989: 286). Furthermore, she emphasizes that ‘the findings that a stronger first language leads to a stronger second language do not necessarily imply that the first language must be fully developed before the second language is introduced. Rather the first language must not be abandoned before it is fully developed, whether the second language is introduced simultaneously or successively, early or late, in that process’ (1989: 287). In short, some anxiety in relation to the strength of the majority language is certainly justified, but protection and development of the minority language can be better achieved by providing extensive and motivating opportunities for its oral and written use rather than focusing on erecting barricades against English.